The Kiosk page is where you can add and maintain Kiosks used for Check-In. Each Kiosk runs on a schedule, which determines when the kiosk is available for use. To connect a Kiosk with Arena, you can simply load the Check-In application directly from Arena or manually add the Kiosk on this page. 1. Click the Add New Kiosk icon. •Select System – Select if the kiosk is a New kiosk or one already Existing to the network. •Computer Name – Enter the name for this, primarily for reporting. •DNS Name – Enter the DNS (Domain Name Server) for the Kiosk, up to 100 characters. It is very important that you do not change the DNS Name. Changing the DNS Name causes you to lose the connection between Arena and the kiosk. Only change the DNS Name if you want to reset your kiosk and run the initial kiosk setup again. However, you can edit the other fields. •Default Check-In Theme – Select a theme to use for the kiosk. A Theme is the display of the kiosk and includes the background image, the text, font and sounds. There are three default options. •Select Default Printer – Select the printer to associate with this kiosk. Be sure to configure the printer for the kiosk. There are additional options available such as, using a central printer. You can select one printer per kiosk. •Printer Name – Select an existing printer or specify a new printer for this kiosk. The network printer name must match what you enter here. •Location – Select all Locations that you want connected to the kiosk. Notice that the list is a tree view, listing the various Locations by Building, as in the setup example used in the Locations section in the Check-In section of this help file. Check the applicable boxes for this kiosk to run. A kiosk can have more than one location assigned to it, but it must have at least one location in order to function. To the right of the kiosk name, you see a Schedule link. Schedule is where you determine the schedule name, the start and end times the kiosk is available, and either centralized or non-centralized occurrence type mode. 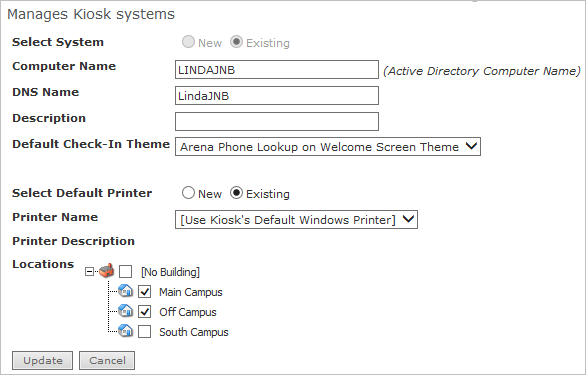 As you evaluate the check-in setup for your organization, keep in mind you can set multiple schedules for any kiosk for times when all (Centralized) Attendance Types for the specific Location(s) are to be available or when a specific (Non-Centralized) Attendance Type and Location is to be available. 1. Click the Schedule link for the Kiosk you are creating. 2. Click the Add New Schedule icon. •Name – This is the kiosk name. •Description – This column displays the kiosk description. •Default Printer – This column displays the default kiosk printer. •Schedule – Click this link to display the kiosk schedule(s). •Delete icon – Click this icon to delete a kiosk. If you delete a kiosk, Arena removes all associated schedules. 3. Complete the fields for this Schedule, as desired. For testing purposes, consider setting a daily schedule. •Name – Enter a name for this kiosk schedule such for Sunday services, special events or for testing. •Frequency – Select the frequency for this kiosk. Options are Daily, Weekly, Monthly, and One Time. •Start and End Time – Enter the start and end times this kiosk is to be available. •Occurrence Type – Select the occurrence type. Options are Centralized and Non Centralized. Use centralized when the goal is to allow multiple Attendance Type(s) for the specific Location(s) to be available. Use Non-Centralized when the goal is to select a specific Attendance Type.